President Trump released his proposed 2018 Federal Budget. The battle lines are drawn. Expect to be inundated with articles like “The rich get richer, and the poor get…” We will quickly be fed up with class warfare, emotional bleeding hearts and hysterical politicos distorting statistics while pandering votes. The final result will be a pathetic “compromise”. Remember, a camel is a horse designed by a committee of politicos. It’s bloated, stuffed so full of crap it cannot function in the manner it is intended. Politicos (career politicians) want a budget that will increase their power and reelection chances – not what is right for the majority of Americans. They have turned spending taxpayers dollars to buy votes into an art form. Meaningful spending cuts are an unnatural act, regardless of political party. Cutting taxes may help election chances; however, only 50% of Americans pay federal income taxes. Targeting a balanced budget is a farce. The working class should demand more, our bloated government is wasting billions of dollars every day. Who gets the gold mine and who gets the shaft! If the income pie shrinks due to tax cuts, will there be real spending cuts or increased borrowing? Interest cost on the current $20 trillion debt is over $500 billion annually. Every 1% jump in interest rates adds $200 billion in interest cost to the budget. Domestically, much of the debate will be framed around tax cuts for the rich, not caring about the poor. Politicos subscribe to the NIMBY (Not In My Back Yard) theory and will be screaming, cut expenses somewhere else. Don’t expect the media to acknowledge that Presidents Kennedy and Reagan both cut taxes. While tax rates dropped, a couple years later, the economy rebounded and federal income tax revenue increased. 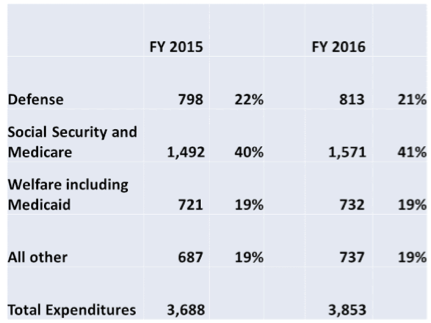 $732 billion (19%) in welfare and Medicaid spending in 2016 is tiny??? What is welfare supposed to do? Is the goal of welfare to help the poor get on their feet, get a job and move up the economic ladder? Or, is it to provide a permanent underclass, keeping politicians who are “champions of the poor” in positions of power? The Single Mother Guide article, “Temporary Cash Assistance For The Poor” discusses the Temporary Assistance For Needy Families (TANF) program. 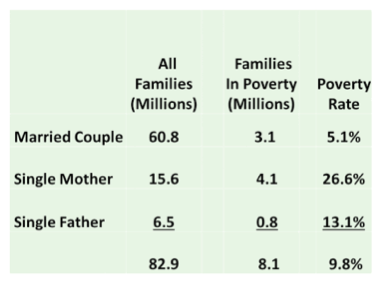 “Single-mother families are worse off than any other types of households with slightly over 40% officially below the poverty level. 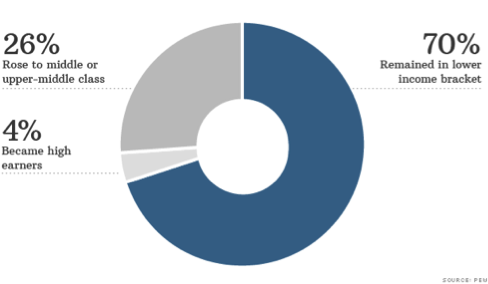 …TANF often becomes a …safety net for over 1.6 million families while they get back on their feet – with single mothers making up the bulk of welfare recipients. How’s the “Grand Idea” working out? Not very well according to a 2013 article, “Making it to the middle class”. 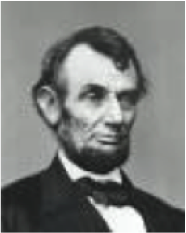 “It’s nice to think one can easily go from being dirt poor to filthy rich, but it doesn’t usually work that way. 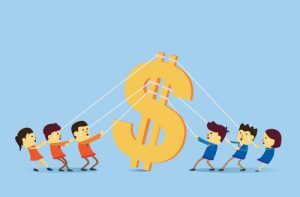 Of people born into lower-income households, few will ever make it into the middle class, according to a study from Pew Charitable Trust. Only a tiny percentage rise into the highest income bracket. 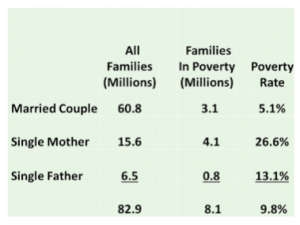 The Pew data is from a study that has followed families since 1968. It uses 2009 numbers. The top 1% is getting richer, the middle class is losing ground and the poor remain so. Why? Three of the four bullet points are behavior, issues over which each individual has some control. …Ron Haskins of the Brookings Institution, testifying before Congress on June 5, 2012. 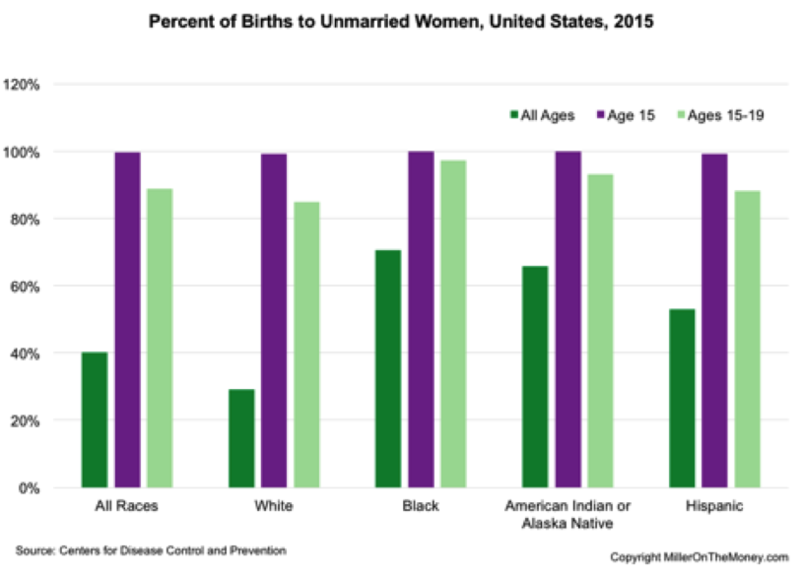 Data from The National Vital Statistics Report, “Births: Final Data for 2015” breaks down the birth rate for unwed mothers by age and race. In 1965 approximately 25% of black children were born to unwed mothers. 50 years later it’s 71%. The War On Poverty has virtually destroyed the black family. 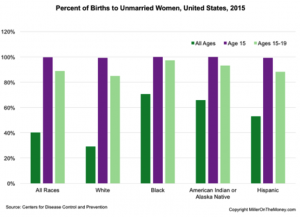 100% of the mothers 15 and under and 97.4% of mothers age 15-19 are not married. It’s no wonder there has been little progress in moving up the economic ladder. There are three factors entering the budget fracas. 1. One side of the political aisle wants to change the behavior of the poor. They want to incentivize them to get an education, get a job, get off welfare, and move up the economic ladder through individual effort and initiative. Citizens are responsible for their own behavior. 2. The other side of the aisle sees things differently. They contend the argument should not be about behavior. They feel the real issue is inequality of income and wealth. The debate should be about why and how wealth should be redistributed – something for nothing. 3. The Tea Party (TEA = Taxed Enough Already) movement is a public backlash against the political establishment and wasteful spending. Citizens are furious with the government confiscating the fruits of their labor while their standard of living is slipping and things continue to get worse. They want real tax cuts and spending cuts. Politicos know that once you have instituted giveaway programs, rolling them back, no matter how ineffective the program is, will cause a huge public and media backlash. It’s politically easier to continue to waste tax dollars than admit failure. Why haven’t the programs worked? Government programs encouraging education and job skills have not worked because the political and community leadership is unwilling or unable to address the CORE of the problem. I define culture as, “the unwritten norms, beliefs and values that define appropriate behavior.” Politicians and the media are correct when they point to income disparity between rich and poor; it’s very real. The dispute is over how to close the gap. The War on Poverty has made things worse. Insanity is defined as continuing with the same behavior expecting a different result. 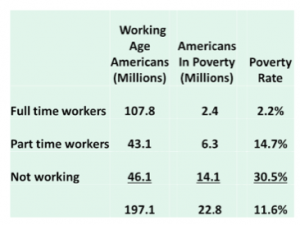 Reducing welfare benefits to incentivize able-bodied people to work has also failed. We now have several generations who have lived their entire life on welfare. Politicos, community leaders, and clergy consistently hammer them. They’re told they are victims, discriminated against and should demand more money from the greedy rich. Are they poor because of the color of their skin or their lack of minimum job skills and work ethic? Until the respective leaders stop spewing hatred and divineness, and redefine the definition of “appropriate behavior” from “dependent on others” to a “strong desire to be self-sufficient,” nothing will change. There must be a culture change before there is a behavior change. It makes no difference which party is in power. Until there is a major leadership change in the poor communities, preaching a different and positive message (with media support), the poor will remain poor; trillions in tax dollars will be confiscated from the working class and redistributed (aka buying votes) while generations of poverty-stricken children will have no chance to improve their lot in life. Over the last year, Jo and I have taken several short getaway trips to Las Vegas. I’m still trying to sort through the events of the Las Vegas Massacre. Our sympathies go out to those who suffered from the premeditated madness. It’s senseless, and I’m angry! I’m angry that any human being, no matter how bad their lot in life, would see fit to harm innocent people. I’m also furious with the political class. It makes no difference if it is a hurricane or a tragic shooting. Within hours we are bombarded with an idiotic, emotional political frenzy as politicos clamor for face time on television. No matter what the president does, politicians and media personalities constantly hammer him, trying to outdo each other with sarcastic nit-picking criticism. Do we really care what kind of shoes the first lady wears when boarding Air Force One? Do we really care that she and the mayor of San Juan both wore boots at the event in Puerto Rico? Is that crap really important? Much of the public is fed up! It’s time for the political class to shut up. Now is not the time to divide the country with partisan politics. Politicos should get the hell out of the way, or roll up their sleeves and provide the resources to help those in need. This is a time to bring America together. My recent physical was a bit stressful. My blood pressure was a little higher than normal. I was praised for losing some weight and my “numbers” had improved. After running a short EKG, the doctor frowned, saying it was “slightly irregular”. She said, my “check engine” light went on and I should visit the cardiologist to make sure all is OK. My “slightly irregular” EKG matched several others and is “my normal”. Blood pressure is back where it belongs and the “check engine” light is off. The event was a blessing. It forced me to stop and reflect. This week I wrote about changing behavior. I can lower my blood pressure by changing my behavior – particularly with a knife and fork in my hand. Well-meaning friends have suggested I give up writing. I try to explain that is what I love. I don’t feel stress when I am researching and writing, it’s quite the opposite. I love the interactions and encouragement I get from my readers, that brightens my day. If there is stress, it’s spending too much time focusing on the business side. I need to turn an expensive hobby into an inexpensive one. It won’t take too much for me to generate enough revenue to cover our cost; it is just setting up the systems to get it done. We announced we are going to rework our FREE reports and use them to build revenue. I’m told that once the reports are written and the marketing systems are put in place, it requires very little time. I sure hope so. 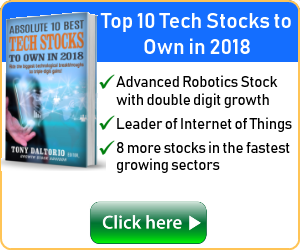 If you haven’t done so, you can go to the Miller on The Money website and download the current versions for FREE until October 16th. If you are a Facebook user we now have a Facebook Business Page. It would really help if readers would go there and “follow” us and “like” things you enjoy. My goal is to make the page interactive where readers can not only communicate with me in real time but also help each other. I believe the biggest enemy of a retiree is boredom. If I have the ability to continue to be a productive member of society, regardless of my age, that is what I want to do. Of course, this week had some irony. As I was cranked back on my Lazy-Boy doing my pondering, the following quote popped up on my Ipad. I always liked Jack London. I’m not sure I agree completely with this statement. Unemployment can happen regardless of behavior. 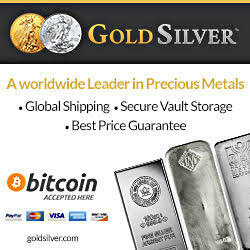 Question: I’m still a novice regarding investing and you have written several times about buying gold and/or silver. Do you mean physically buying it or is there some sort of an investment such as a stock? I spoke with my financial advisor about this last time we met and he sort of looked at me like I was nuts. 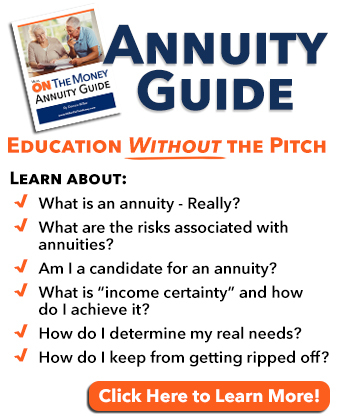 I am required to tell you I am not licensed or qualified to offer individual, personal investment advice. Most all my comments are general in nature and I will suggest you consult with a licensed professional. As to your first comment, unemployment can happen. If I understood the survey correctly 34% of the people did not experience unemployment. When I speak about buying gold, I am talking about owning the physical metal. Yes, I expect your financial advisor would look at you that way, it is very common. 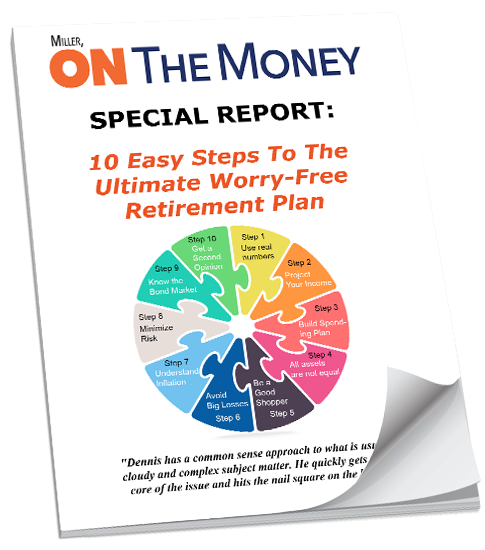 I’d urge you to go to the website https://www.milleronthemoney.com and scroll through the archives. Look for articles about gold and also inflation and you will see why I make the recommendations. 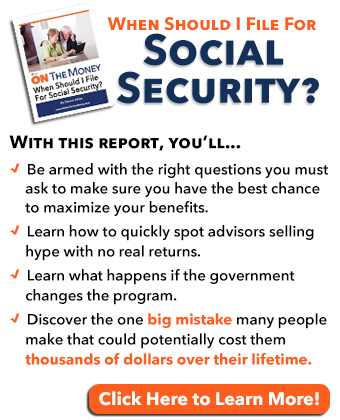 I suggest you ask stock broker or financial advisors what they are doing to protect your life savings from inflation. If they say they use Treasury Inflation Protected Securities (TIPS) you may want to point out, by design they DO NOT protect your portfolio. If you have a $100,000 portfolio, including $10,000 in TIPS, only the amount in TIPS is inflation protected. The latter article spells out the inflation concerns. Each investor has to use their own judgment. I hope the articles help. An unsound monetary system. One must understand that if The State (central government) was unable to debauch the currency, then they would be unable to subsidize the citizenry. It is this act of subsidization that CAUSES the cultural rot. Once the unsound monetary system is firmly in place, then what must The State do to pay for the ever increasing demands placed on it by the victimized and elite classes that demand it? Simple: they engage in legitimized theft of the citizenry. The State, in fact, engages in every form of deprivation imaginary in order to maintain itself and its benefactors in the way in which they have become accustomed to…until they can’t. Generally speaking, in primitive societies you either hunted for food or you starved. When it came to survival you were on your own. Now, along come the politicos who want the perks and power and, as you said, confiscate and redistribute wealth. That breeds a welfare state and since LBJ it has been growing to unsustainable proportion very quickly. Historically a collapse eventually happens. What happens then? Those with no survival skills are still screwed, and those with wealth better protect their wealth from individual predators in addition to government. When I referred to the root cause, I was speaking as individuals. I feel it is a behavior issue. Unlike government, the individual has some element of control. 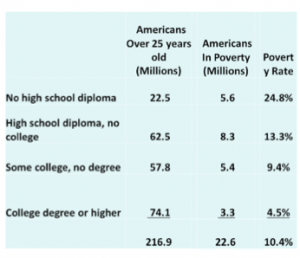 If an individual wants to get out of poverty, they have a very high probability of doing so if they get an education, get married and then have a child. The stats are amazing. The politicos who take the behavior side of the issue never succeed in getting many people out of poverty. Their ideas never work, and will not work. Until there is a change in culture making an eduction, work, marriage and delayed parenthood the cool thing to do expect status quo to remain. Cool stuff, thanks for sending it along.